September 18, 2012 Britney Crosson1 Comment on Saturday Shopping Success! I recently took my baby to the mall to go shopping with me – not a grocery store or Wal-Mart or Target – but an actual mall. I’m not sure about other parents, but I know that this parent does not frequent shopping malls. I associate a mall with “fun shopping” and quite frankly, that’s something that I don’t get a chance to do very often. But thanks to my 32nd birthday, I had a bit of birthday cash burning a hole in my pocket. So, off to the mall we went. 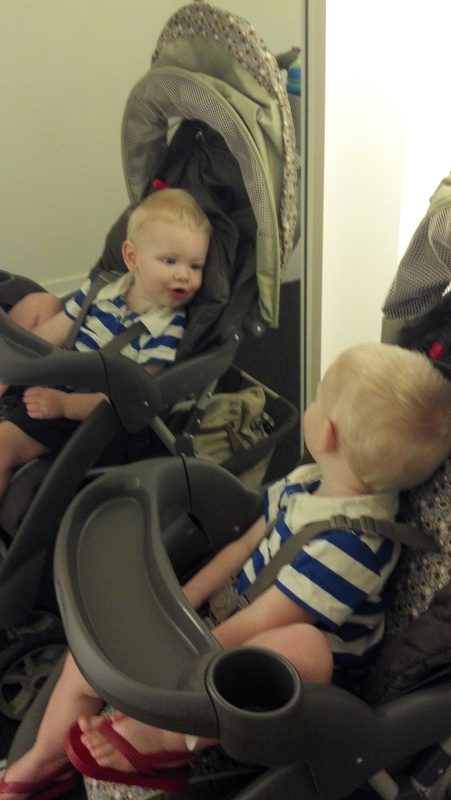 Rowdy checking himself out in the mirror at Banana Republic.